Access resources from Food for Thought here. View videos from Food for Thought here. PAULA DANIELS was Los Angeles Mayor Antonio Villaraigosa’s Senior Advisor on Food Policy and Special Projects in Water. 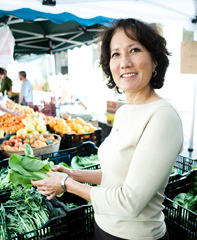 She is the founder and fulltime Chair of the Los Angeles Food Policy Council, a policy based collective impact initiative of food system leaders. An attorney, she has been actively engaged in California environmental policy issues for over 20 years, when she first became involved with Heal the Bay. She has served on a number of boards of environmental and Asian American non-profit organizations and bar associations, and is the recipient of a number of recognitions and awards. She was named by the LA Weekly as one of the top ten people making Los Angeles a better place, in their People 2012 issue. RAFFI is a renowned singer and a pioneer in quality recordings for kids, as well as a music producer, author, entrepreneur, and ecology advocate. He is the recipient of numerous honours, including the order of Canada. 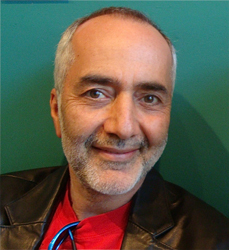 In 2010, Raffi founded the Centre for Child Honouring, a global movement that views honouring children as the best way to create sustainable, peacemaking culture. In 2013, Raffi wrote Lightweb Darkweb: Three Reasons To Reform Social Media Before It Re-Forms Us. This book focuses on safety, intelligence and sustainability, and highlights children’s developmental needs as a key missing consideration in the digital revolution. INDIGENOUS FOOD SOVEREIGNTY – For thousands of years, Indigenous communities have been sustained on this land through interdependent relationships with the land, air, water, soil, plants and animals. Indigenous food sovereignty provides a restorative framework for health and community development and reconciling past social and environmental injustices in an approach that people of all cultures can relate to. Through research, action, and a reconnection to tradition, they are attempting to move in that direction again. And there are a myriad of ways that local governments can support them. NATURE DEFICIT AND NATURE SCHOOLS – Human beings, and especially children are spending more time in front of a screen and less time outdoors. It’s a trend many people think needs to change. This drive to reconnect to nature saved a Sunshine Coast school from closure and revitalized a neighborhood in the process. In this workshop you’ll hear an overview about the growing movement to address Children’s Nature Deficit, our changing demographics, and the inside story of how going green saved a school and a neighborhood. CLIMATE CHANGE AND FOOD – A sustainable food system is the foundation of sustainable society. What implications does climate change present for our food system? 21st century agriculture will operate in economic, social, environmental and resource constraints that are very different from the 20th century. What factors and forces have shaped our industrial food system and what will shape our food future? How can we advance a 21st century vision for the sustainable food system which is so integral to our future and what role can local governments play? POVERTY AND ACCESS TO FOOD – Poverty and food insecurity are major factors in healthy child and community development, and key intersections that comprehensive social policy seeks to address. The challenge is to look beyond food banks and other emergency services, to build social structures that nurture long term health, provide dignity, and allow people to thrive. This is a key lesson for Seth Klein when he participated in the Raise the Rates coalition’s welfare food challenge, and is a key part of Lynn McIntyre’s research on income-related household food insecurity and food policy in Canada. FOSSIL FUEL DIVESTMENT – More and more local governments are facing questions about the impacts of climate change, and the risk of having money invested in fossil fuel companies. The fossil fuel divestment movement has grown around these concerns. The movement was initiated by Bill McKibben and a global organization called 350.org. In Canada campus-based student groups are leading the charge, and their message is spreading to municipalities, faith groups, labour unions, and schools. SANCTUARY CITIES – An estimated 500,000 undocumented migrants face significant barriers accessing education, healthcare, food aid and other essential services in Canada. Across the country, the “Sanctuary Cities” campaign is making urban services more accessible to those without papers. In February 2013, Toronto became the first Canadian Sanctuary City, with council passing an ‘Access without Fear’ motion by a vote of 37-2. Hamilton, ON passed a similar motion in February 2014. Along with Toronto and Hamilton, 36 cities in the United States have officially designated themselves ‘Sanctuary Cities’. Download the Full Event Program here. Click here for descriptions of highlighted sessions. Click here for a list of highlighted speakers. Thursday, April 3rd’s lunch session for elected officials will provide a productive space for conversations and networking for political representatives of all kinds. The day is supported by the BC Mayors’ Climate Leadership Council, which was formed in 2010 to recognize and support local government leaders who are taking action to address climate change in their communities. April 3rd, 11am – 2:30pm. $50.